This is actually great: Barry Bonds, the star of Bob Costas's nightmares, will provide scholarships for Bryan Stow's two grade-school-age children. Stow was brutally beaten at Dodger Stadium in March for wearing a Giants jersey. His condition is slowly improving, and police recently arrested a suspect in his beating. 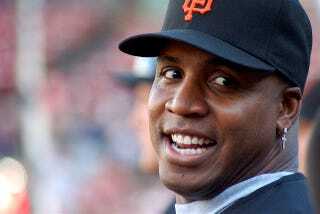 Stow family attorney Thomas Girardi said that former slugger Barry Bonds has donated to pay for their college education. He said the family has talked about turning other donations back to the fans if this suit is successful, but said the gift of a college of education is something they treasure and will keep. Bryan is a single father. He has a son and a daughter who are both in grade school. Bonds visited Stow on April 22, while he was still in a Southern California hospital. Sources close to Stow told NBC that Bonds also spent an hour in Stow's room and left a signed baseball bat for Stow's children. At the time, there was no mention of a donation to a college fund. It's kind of noteworthy, too, that Bonds did this over a month ago—shortly after the verdict came down in his stupid trial—and that he didn't say anything about it to the press. Stow's lawyer mentions it here only because the family was so excited to have such a gift AND from a Giants icon, to boot. So, please, a moment of thanks for Bonds's generosity, before you return to cursing him for eternity.